Home / Market Insight, Financial Articles / Weird Street / Amazon to Sell and Ship Live Christmas Trees This Year! Amazon (NASDAQ:AMZN) is stepping up its Christmas game this year with the selling of live Christmas trees. Amazon selling live Christmas trees may come as a bit of a surprise to some, but this isn’t actually anything new for the company. It actually started selling them last year. However, there were some limits then that made the offer less than amazing. The original offer for live Christmas trees from Amazon was only for a 3-foot tree. That’s changing this year with the online retail company now offering to ship a Christmas tree up to 7 feet tall to customers. Customers that don’t want to leave their homes to do Christmas tree shopping may be all about this offer, but there are some things to take into account. This includes the high price of $115 for a 7-foot Fraser fir from North Carolina. While the high price of the Christmas trees may turn off some, there are other benefits to the deal. 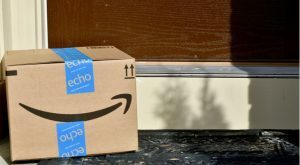 Specifically, Prime customers will be able to get some of the trees without having to pay for shipping, reports the Associated Press. Here’s how Twitter (NYSE:TWTR) users are reacting to the Amazon Christmas tree offer. Amazon will start selling the Christmas trees in November. Article printed from InvestorPlace Media, https://investorplace.com/2018/09/amazon-to-sell-live-christmas-trees/.